In the tropics, Marigold is a year-round bloomer with large pompon-like flowers, usually seen in sunny and cheerful colors of yellow and gold to orange. An old favorite bedding plant in gardens and parks, it has retained its popularity even till today, bringing sunshine and smiles with its reliability and constant flowering. Marigolds are also popularly grown in containers as ornamental plants to decorate halls for social and religious functions and ceremonies. 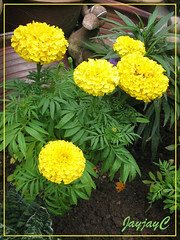 Features: Tagetes erecta and Tagetes patula are species of the genus Tagetes. 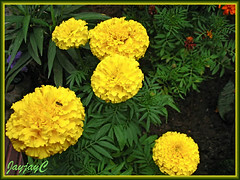 Commonly known as Marigolds, they are rapid-growing annual flowering plants with heights ranging from dwarfs of 6-8 in, to medium and taller ones that grow from 9 in to 3 ft tall or more. Herbaceous, upright and branching, they bear medium to dark green leaves that are fern-like with narrow toothed segments. Leaves of most cultivars and varieties are strongly scented and rather unpleasantly too. Above this lovely greenery are displayed stunning and attractive flowers that come in various sizes, forms and colors due to hundreds of varieties and cultivars developed over the last few centuries. Bloom sizes range from 2-5 inches across, may be single, double or crested and come in marvelous hues and intensity of yellow, gold, orange, red, maroon, mahogany, white and bicolors too. 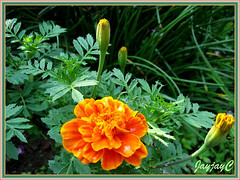 They bloom non-stop through the growing season, hence perfect for any garden spot with splashes of bright colors. 2) Tagetes patula (French Marigold) – small and bushy plants with height from 6-18 in, bearing single or double flowers up to 2 in across and has a longer flowering period from spring until frost. 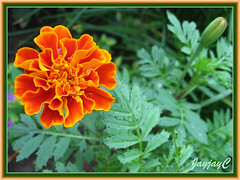 Also, there is the Triploid or Mule Marigold which is the sterile hybrid and a cross between the tall African and dwarf French Marigolds, resembling the French Marigolds but have larger flowers. Another species, less known is Tagetes tenuifolia/signata (Signet Marigold) which is a compact plant with finer leaves and smaller, single flowers that are edible and colored yellow, orange or rust-red, best suited for window boxes and as an edging. The name Marigold also refers to Pot Marigold (Calendula officinalis) of the genus Calendula, which is not a true marigold of the genus Tagetes. 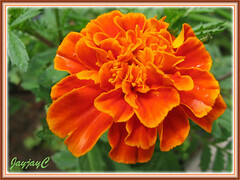 Culture (Care): Marigolds are hardy and non-fussy annuals, easy to grow and rewards generously with non-stop flowering. Light: Full sun and heat. Thrives best in hot climates. Moisture: Water regularly, especially during hot and dry seasons. Soil: Prefers organic-enriched, moist and well-drained soil. Nevertheless, it is adaptable to any soil type. Others: Snip off the first flowers before they open to induce more flowering. Deadhead regularly to encourage more flowers and prolong the blooming period. Potash fertilizer can be added occasionally to prolong the flowering period too. Fertilize sparingly as an excess may encourage luxuriant foliage at the expense of flowers. The taller and large-flowered Marigolds may need some staking. Relatively pest free but do check for slugs and snails, and watch out for powdery mildew, whiteflies and spider mites. For subtropical regions: Hardiness: USDA Zones 9-11. These are tender tropical plants that are killed by frost, but can be grown as annuals anywhere. Propagation: Easily propagated from seeds (black and needle-like) sown directly into the garden ground or started early indoors and transplanted outdoors when there’s no danger of frost. Germination usually takes 5-7 days at 65-75 degrees F.
Usage: Marigolds are excellent for borders or beds, edging, in mass or mixed plantings and landscaping. The taller marigolds can be trained as a standard specimen. Marigolds are very ideal for container gardening, with pots at porches, decks or windowsills and even as decoration at social and religious events and ceremonies. An added bonus is their attraction to bees, butterflies and birds. It is said to be a natural insect repellent against certain garden pests but some have disprove this myth (?). 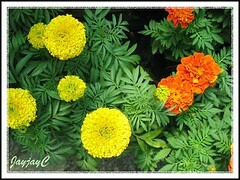 Tagetes erecta and Tagetes patula are good as cut or dried flowers. In South Asia, the colorfully bright yellow, orange and red flowers are used by the thousands as garlands and to decorate religious icons and buildings. Hence, they are cultivated commercially as flower crops (floriculture) and cash crops in India and Pakistan. They contain lutein, a carotenoid pigment that can be extracted and used as a natural food colorant for livestock and pet food. T. erecta is used as a South Asian traditional medicine, where the leaves and flowers are well-known for blood purification, reduce blood flow and inflammation. And, it is claimed that these African and French Marigolds contain certain other beneficial compounds and essentail oils for cosmetic, health and medicinal uses. More at Plant Cultures and Plants For A Future.